All students can learn and deserve opportunities to do so in a safe and comfortable environment. Differentiated instructional strategies should be implemented to actively engage all learners. A quality education is best provided when curriculum and instructional practices are data driven and research based. Optimum proficiency is achieved by the combined and collaborative efforts of all stakeholders. Continuous school improvement is imperative for students to reach their full educational potential and become life-long learners. Student benefit is the most important catalyst in the decision making process. 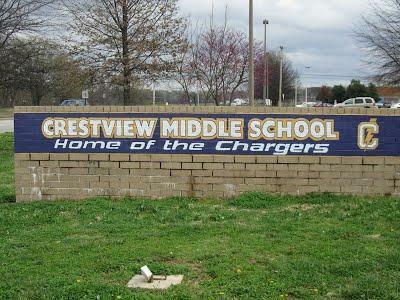 Crestview Middle School is a public school in the Tipton County School System in Covington, Tennessee. It contains grades 6 through 8 with approximately 521 students. Numeracy & Literacy ~~ 5. Crestview Middle School: Where we shape dreams into realities. Crestview Middle School opened in 1992 becoming home to the 6th, 7th, and 8th graders formerly housed at Crestview Elementary School. The 5th grade joined CMS in the fall of 1994. In 2004, CMS expanded with the building of two new wings on each side of the school providing additional classrooms. Why the name Crestview instead of Covington Middle? According to Dr. John Earl Wells, retired educator from Tipton County Schools, the other three elementary schools (which is all that were built then and were K-8) were named for the town/community -- Brighton, Munford, Drummonds. Since there was already a Covington (in its own school system), our name came from the fact that it was on the 'crest of a hill'. The street stopped at the school so you could only see it from the highway and it was noticeably on a hill. The street did not go completely through until the middle school was added years later. The middle schools all kept the name of the elementary that fed into it. Also regarding the name, the Board also considered Oak Elementary because there was a huge oak tree just as the hill began rising. All of this property belonged to Judge Mark Walker (thus the street name) and it was farmland. Many crop fields had a big tree or two for shade. The good thing is that the lone oak tree was struck by lightening just a couple of years after we moved there! The trees that are now there were planted by the PTO to provide the only shade anywhere on the property. In 1999, Crestview Middle School became the first school in West Tennessee to receive the Crestview Middle's WeatherBug Station as seen on Channel 3 WeatherNet program. This program allowed News Channel 3 viewers to actually see real-time live weather conditions from the school site. The Bank of Tipton became the sponsor of WeatherNet 3 at Crestview Middle and remains so today. Crestview Middle's WeatherNet site can be seen on News Channel 3 during the weather segments. In August of 2001, Crestview Middle also became a site based location for ANSS (Advanced National Seismic System) from The University of Memphis Center for Earthquake Research Institute. There is actually a seismic monitoring device buried on our campus to detect and record activity in this area. To see more information about ANSS, please visit The United States Geological Survey ANSS web page (to be updated). Crestview Middle served 5th, 6th, 7th, and 8th grade students in and around the Covington area. The average student enrollment at CMS is about 800-900 students. Crestview Middle's mission is... to engage all learners in meaningful lessons that promote high educational achievement in a safe and nurturing environment. The CMS faculty and staff work hard to ensure that each student is receiving the best quality education in a comfortable environment conducive to learning. Crestview Middle offers opportunities for students to demonstrate leadership in several ways. The National Junior Honor Society offers 7th and 8th graders a chance to participate in CMS's local chapter. Sponsors monitor and inspire them to always do their best in representing CMS in the areas of academics, service, leadership, citizenship, and self discipline. The Student Council is another student opportunity to demonstrate leadership at Crestview Middle. The sponsors inspire students to serve others and their school community. While academics and student learning is the cornerstone of our school, we have been also known throughout the area for our sports teams. Crestview Grizzlies have earned quite a reputation for athletic success and many of our students participate in school sports. CMS students have the opportunity to participate in football, basketball, volleyball, softball, cheerleading, and track. We also have had a full choir and marching band through which students get a chance to develop their musical talents. In 2008-2009, Crestview Middle School was voted by the readers of The Covington Leader as the #1 middle school in the Tipton County School System. We also had staff members who received people's choice awards through the same newspaper poll. The CMS educational leaders, faculty, and staff are constantly striving to improve our school to better meet the educational needs of the children in our community. 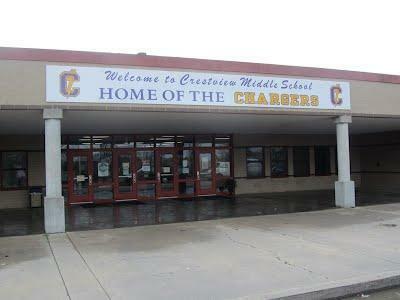 In 2010, Crestview and its community voted to transition to The Chargers and the purple and gold colors. We were excited to this change and have looked forward to being ready to embrace the Chargers when they enter Crestview Middle in the fall of 2010. In the spring of 2012, Crestview Middle began a Charger & Lady Charger Tennis team. In the fall of 2012, Crestview Middle will be home to 6th, 7th, and 8th grade. This past spring, it was proposed, voted, and approved that 5th grade be transitioned back to Crestview Elementary School this fall. In spring 2017, Crestview Middle formed a Charger baseball team for middle school students. In fall of 2018, Crestview Middle formed a Charger Cross Country Team for middle school students. In February 2019, the CMS Chargers Boys basketball team had 22 wins and 2 losses, and made it to the finals of the inaugural State Tournament for Middle School Basketball. This is the first Tipton County Team including Middle and High Schools, to make it to the Basketball State Tournament Finals. The Chargers lost to Bellevue from Memphis. One-hundred-eleven middle schools in the state had the opportunity to qualify for Sectional Tournaments across the State. Thirty-two teams made it to the Sectionals. Four teams made it to the State. CMS boys were Area Champs, Sectional Champs and State Runners-Up.